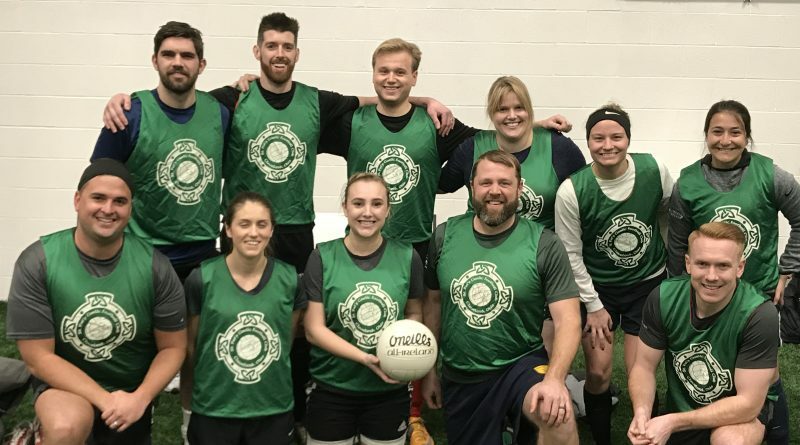 On the Pitch: Cleveland St. Pat’s – St. Jarlath’s Gaelic Football Club is beginning the year by participating in indoor soccer leagues at the Caps Fieldhouse in Valley View. The Club has put forth two teams to compete in the Men’s Open and the Coed Leagues. Not only are current players stretching their legs and honing some foot skills in the off-season, but the Club is using the leagues to recruit new players to Gaelic Football and the social aspects of the Association. The leagues run the months of January and February. 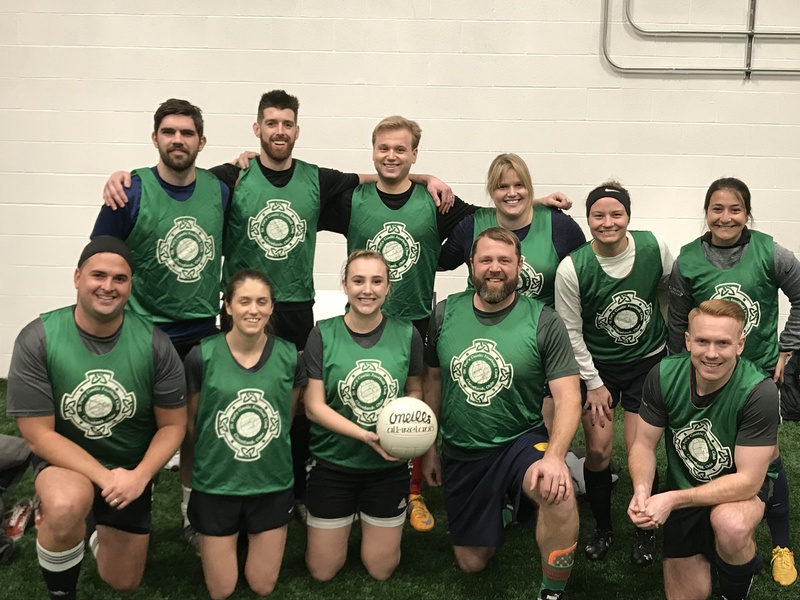 Following the indoor soccer, the Club will begin to transition to Gaelic Football at Soccer Sportsplex in North Olmsted. Coed indoor trainings and games are planned Fridays evenings (7-8pm) in March (8th, 15th, 22nd, 29) and Thursday/Wednesday evenings (7-8pm) in April (4th, 10th, 18th, 25th). According to Men’s Coach Simon “Sizzler” O’Doherty and Ladies’ Coach Daniel Murray, if the weather is nice enough outdoor trainings could also begin in April for the typical two-a-week sessions. The indoor sessions are formatted for the new player to try a few of the unique skills, get to know current club members, and have fun playing in at semi-competitive speed. Cleveland GAA is excited to announce that they will be hosting a Gaelic Football 7-A-Side Tournament on Saturday, May 11th, at the West Side Irish American Club. At least two fields will be live with Men’s and Ladies teams from 10AM to 6PM, while the craic will be had in the pavilion. Come out to see the action and join in the Gaelic fun. Corporate promotions are available for this 501-3c event. Contact info@clevelandgaa.com. 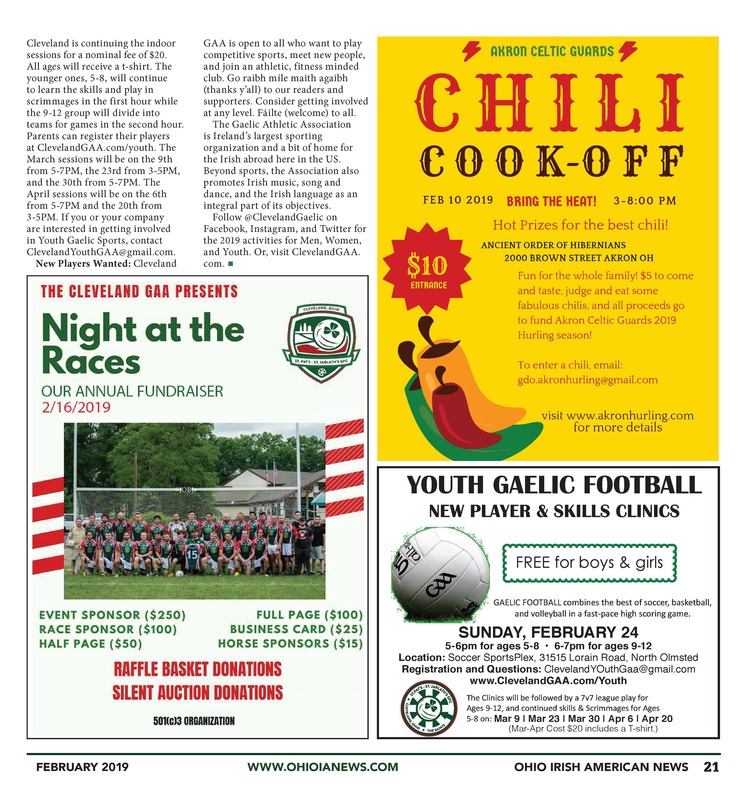 Off the Pitch: Cleveland is hosting the Gaelic Athletic Association’s (GAA) Foundation Level Coaching Clinic on Sunday, February 10th, starting at 10:30AM at the Flat Iron Café. This full day of classroom and field learning will be presented by the USGAA’s Youth Chairman, Paul Mulcaire. The course is the first step in coaching Gaelic Football or Hurling at any age and is aimed at beginner coaches. The attendee will be introduced to the Games, taught skill development, learn movement skills, and instructed on the aspects of coaching children, youth and adults. The course is FREE and lunch will be provided. Pre-registration is required for those seeking certification. Contact ClevelandYouthGAA@gmail.com. On Saturday, February 16th, the Club will co-host the annual Night at the Races at the West Side Irish American Club. 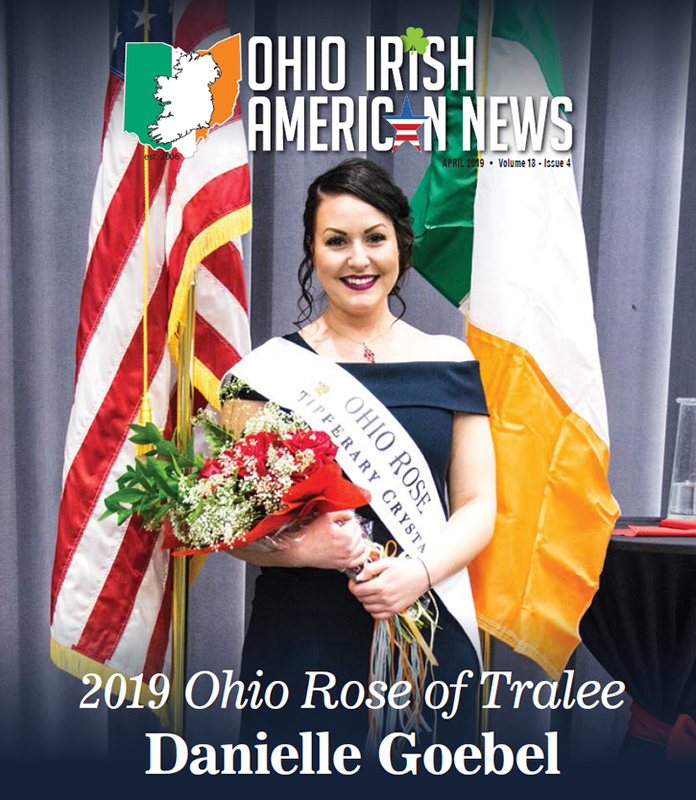 For the admission cost of $25, the night offers a hot dinner, open bar of Guinness, Harp, Miller Lite, and wine, free onsite child care, race betting, 50/50 sideboards, silent auctions, and raffle baskets. 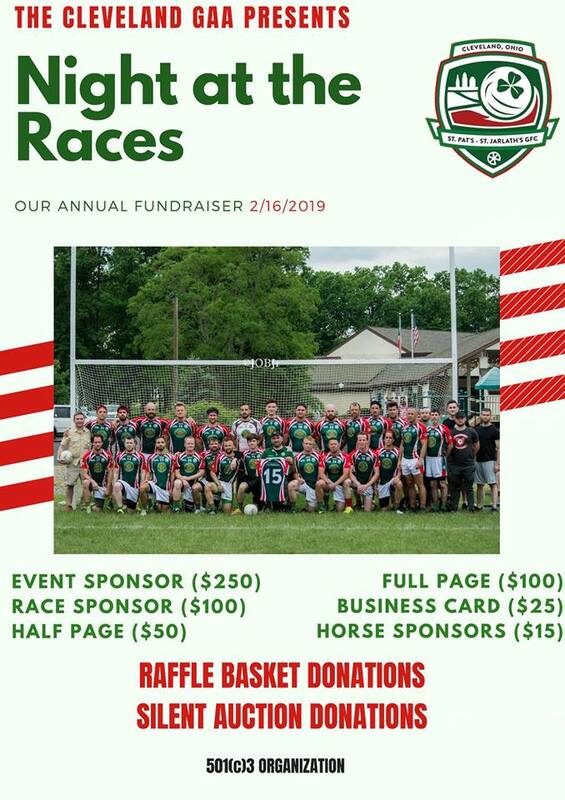 Come join the fun and the Irish sporting community in the Club’s largest fundraising event of the year. 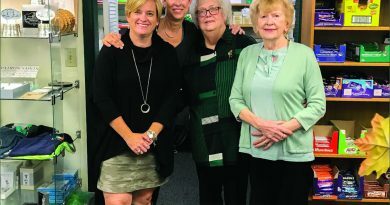 The night puts the club on solid financial ground. The money raised goes into the continued care for the WSIA field, Páirc na Naomh, registration fees, the youth program, and travel costs. For tickets, horse sponsorship, race sponsorship, advertisement, or raffle donations contact ClevelandGAA@gmail.com. The evening is a great way to catch up with old GAA teammates and to meet the new players. Youth. 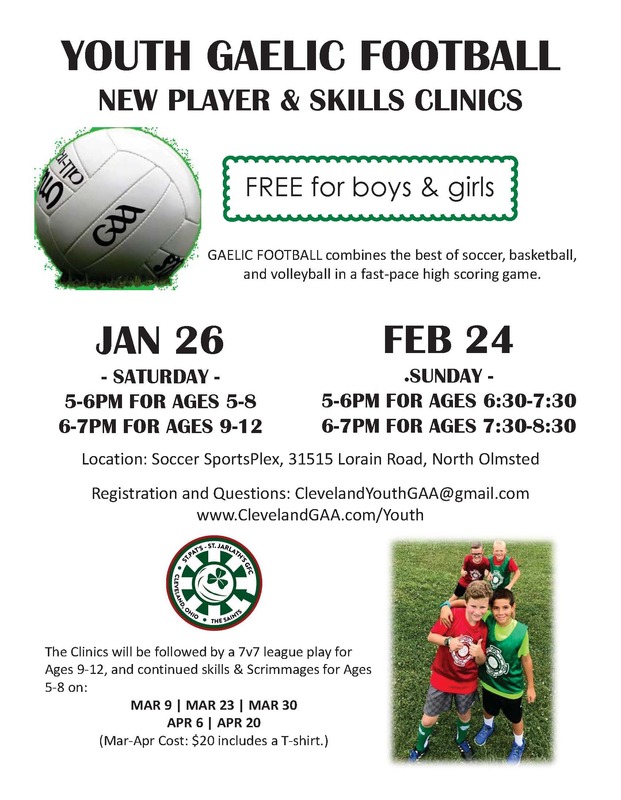 Cleveland St. Pat’s – St. Jarlath’s is once again offering FREE Gaelic Football nights at Soccer Sportsplex in North Olmsted on Saturday, January 26th, from 5-7PM; and Sunday February 24thfrom 6:30-8:30. The first hour is reserved for ages 5-8 and the second for ages 9-12. Following the free sessions, Cleveland is continuing the indoor sessions for a nominal fee of $20. All ages will receive a t-shirt. The younger ones, 5-8, will continue to learn the skills and play in scrimmages in the first hour while the 9-12 group will divide into teams for games in the second hour. Parents can register their players at ClevelandGAA.com/youth. The March sessions will be on the 9thfrom 5-7PM, the 23rdfrom 3-5PM, and the 30thfrom 5-7PM. The April sessions will be on the 6thfrom 5-7PM and the 20thfrom 3-5PM. If you or your company are interested in getting involved in Youth Gaelic Sports, contact ClevelandYouthGAA@gmail.com. 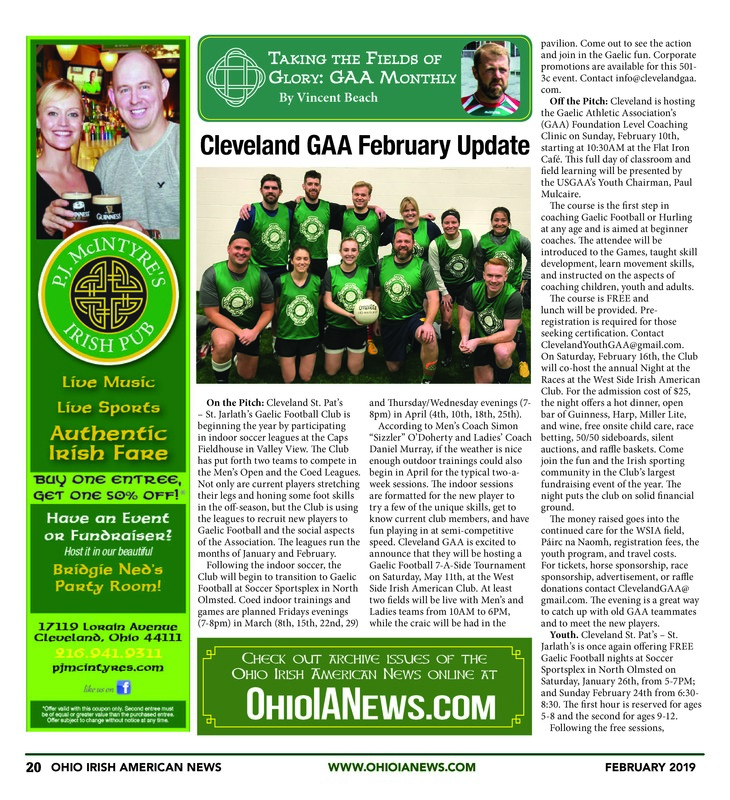 New Players Wanted: Cleveland GAA is open to all who want to play competitive sports, meet new people, and join an athletic, fitness minded club. 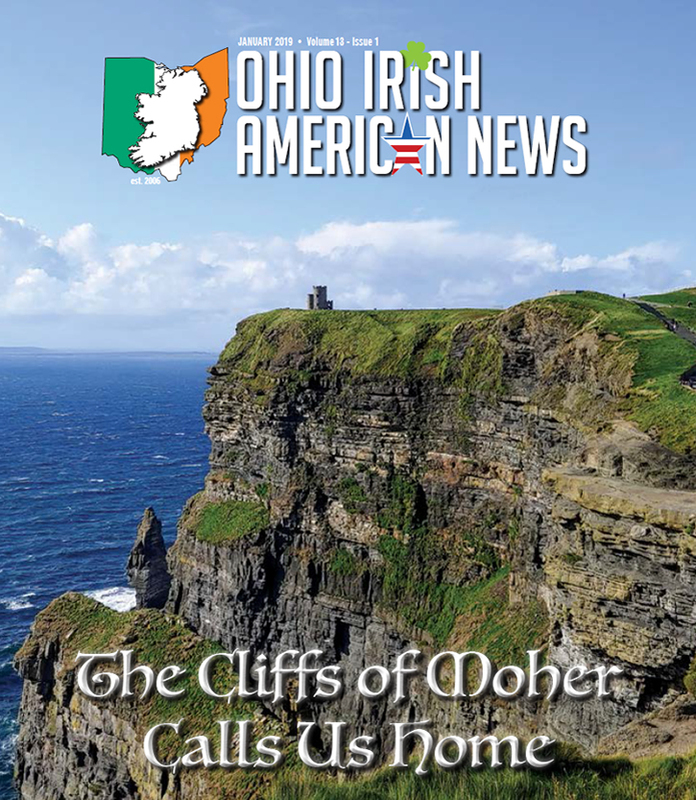 Go raibh míle maith agaibh (thanks y’all) to our readers and supporters. Consider getting involved at any level. Fáilte (welcome) to all. 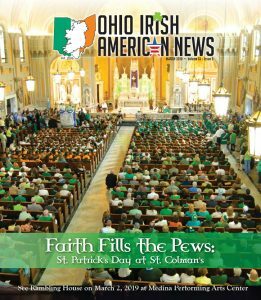 The Gaelic Athletic Association is Ireland’s largest sporting organization and a bit of home for the Irish abroad here in the US. 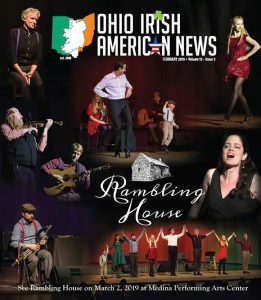 Beyond sports, the Association also promotes Irish music, song and dance, and the Irish language as an integral part of its objectives. 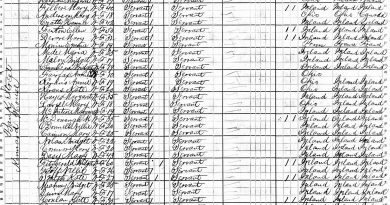 *Vincent Beach is a builder, footballer, and teacher of Irish language. He is the current chairman and youth coach for the Cleveland St. Pat’s – St. Jaralath’s Gaelic Football Club. During the off-season he can be found in PJ’s basement at Speak Irish Cleveland. He can be contacted at clevelandgaa@gmail.com. 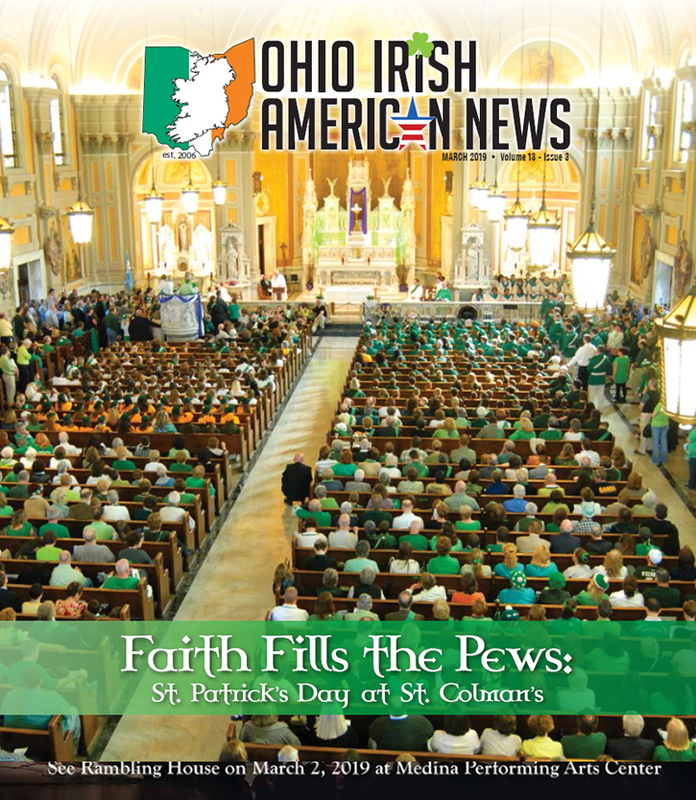 ← Editor’s Corner: A Hallelujah Christmas?